An American in Ireland: New US Customs operation means ugly luggage is "out"
New US Customs operation means ugly luggage is "out"
"I have to have new luggage before I go to America again." So said my wife after her first venture through the new US Customs check at Dublin Airport. She told me this three weeks ago in the departure lounge awaiting our flight to New York, but repeated it again yesterday. "I have to have new luggage before I go again." You see, the trouble is, luggage is not something we ever invested much in. Although she'd rarely agree with me on such matters, she did go along with my view that luggage only has to be functional, not attractive. I pointed out that cases were tossed around and occasionally maltreated by airline and/or airport staff, so why I pay for something that looks good. That was before our July 20 flight to America. Anyway, starting this year, US Customs opened a pre-clearance operation at Dublin airport, which is an added extra to the immigration pre-clearance operation that has existed for years. Now, in addition to checking that the passports and other papers are in order, the American official will show you a picture of each of your suitcases and ask you to confirm that each one is yours. This is where the problem with our bags arose. My wife was mortified by our luggage. While ugly cases may have been acceptable when we were just lifting them on to a belt before the flight and collecting them off a belt afterwards, they were suddenly rendered 'totally unacceptable' because some man called up a picture of our ugly cases on his computer screen, turned the screen towards us, looked my wife in the eye and asked, "Is this yours?" After muttering "Yes" three times, my wife walked away from the desk and towards our flight for our vacation feeling nothing but shame, burning shame. With that the suitcase known in our family as "the carpet bag" was out; the case known as "the ratty, flea-bitten one" was also out. For the moment, the third case, a (possibly) passable nondescript red bag, has managed to survive the chop, but what she wants is "elegant" luggage. My hopes that my wife might change her mind with the passing of time have been dashed. 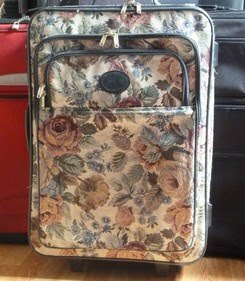 I'm mourning the loss of such easy-to-identify luggage, but next time a customs official turns his screen towards my wife and asks, "Is this yours" she wants to be able to look him back in the eye and say "Yes" with a bit more dignity.